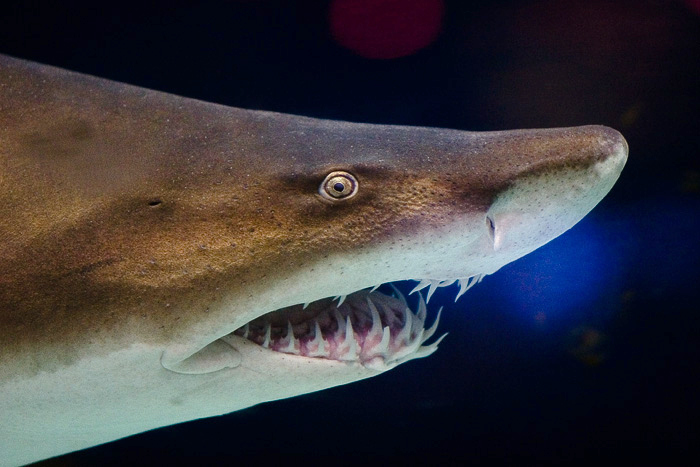 Species Profile: The Sand Tiger Shark - We Love Sharks! 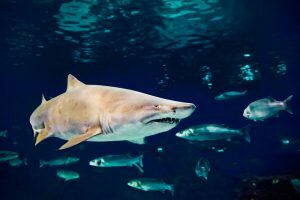 Species Profile: The Sand Tiger Shark - We Love Sharks! The Sand Tiger Shark is a powerful-looking shark with embryos that eat each other. The name Sand Tiger Shark is actually a collective name for four different shark species in the family Odontaspididae. Also, the name is not to be confused with the Tiger Shark (Galeocerdo Cuvier) which is a completely different species on its own. An adult sand tiger shark has a rather pointy head instead of a round one, with a conical shaped flattened snout. It has a bulky body with its mouth extending in length from its eyes – which are small and do not have any eyelids. Adults have reddish-brown spots all over the hind side of their bodies. This shark exhibits a nocturnal behavior: active during the night and asleep during the day. This extraordinary creature is known for its stealth in hunting. It’s the only shark that is able to gulp air and hold it inside its stomach for a long time, thereby appearing motionless to its prey. This gives the shark an added advantage while hunting for which it travels great distances, often leaving its shelter far behind. Although they are feared due to their large size and a rather scary appearance, the sand tiger shark is actually quite tame and not a threat to humans. Because of its calm nature, this shark is often kept and displayed in aquariums all around the world. In addition, it’s hardy and does well even in captivity. Sand tiger sharks are declining in population at an alarming rate. This is largely due to an unusually low birthrate (one or two pups at a time and only after a couple of years). Overfishing is also a major problem for this species causing a permanent decrease in their numbers. They’re often hunted down as a prized possession in many parts of the world for their liver oil. The IUCN lists this shark as Vulnerable. Adults of the sand tiger shark species grow up to between 2 and 3.2 meters (6.5 and 10.5 feet). This shark is generally considered harmless to humans. Even in cases where it is crosses paths with fishermen, the shark is known to steal fish and run away rather than attack. In fact, fishermen perceive these sharks to be rather shy. When humans get too near, they swim a couple of meters away to maintain distance. So regardless of its appearance and build, the sand tiger shark is a shy creature that causes no harm to humans. Regardless of its powerful and fearsome appearance, this shark is relatively placid and unconnected with any confirmed human fatalities. This shark mates in March/April (northern hemisphere), and August to October (southern hemisphere). Males fight for the attention of the females and attract them by biting their fins. Interestingly in this species the females bite back! After fertilization, the lucky male will swim off leaving the female to other interested males nearby. While the embryos are developing, they may number up to 50 in each of the mothers uterus. But the largest embryo ends up eating all the smaller ones until there’s only one left in each uterus. As a result, there are just two pups each time the shark delivers. Because the fight for the fittest occurs inside the shark’s uterus, the pup that is finally born is already tough and can survive relatively well on its own. Newborn pups measures about 1 meter (3.3 feet) in length. Sand tiger sharks have one of the lowest birth rates among sharks: just a couple of pups every two or three years. Due To Its Hardy Nature, The Sand Tiger Shark Is A Favorite Of Aquariums Worldwide. The sand tiger shark is one of those creatures who are active at night instead of during the day. Of course, they hunt at night as well. For a good hunt, this shark will swim long distances often far away from its place of shelter. The sand tiger shark is extremely stealthy and so is a pro at catching its prey with a swift motion of its fins. A group of these sharks can come together to take down much larger prey. One major trait that is hardly seen in other sharks is that it gulps and stores air in its stomach for a long time. This allows it to remain motionless underwater for long aiding its ambush strategy. Their main diet is another shark species: the benthic smooth-hound shark. They also eat rays and skates. The population of the sand tiger shark is declining at an alarming rate. It’s presently categorized as Vulnerable on the IUCN Red List. One of the reasons for this is that it reproduces at a very slow rate: just a couple of pups in two years. But, the more threatening factor is that of overfishing. Humans in all parts of the world capture this shark using fishing nets. For instance, they are a very popular trade item in Japan. Shark liver oil is a prized product that is used in industries related to cosmetics. Another problem is marine pollution. Although laws exist to limit factories and other producers from dumping their waste into water, many countries around the world still do not enforce strict punishments against those involved in this act. For this reason, the sharks are unable to thrive where they should and end up suffering many of the side effects of the toxic chemicals dumped deep under water. Sand tiger shark (Carcharias Taurus). Indian sand tiger shark (Carcharias Tricuspidatus). The small-toothed sand tiger shark (Odontaspis Ferox). The large-eyed sand tiger shark (Odontaspis Noronhai). The first specimen of sand tiger shark was caught off the coast of Sicily by Constantine Rafinesque. He named it Carcharias Taurus or “bull shark.” This name was often disputed by other scientists and challenged. After several changes to the name, in 1971 it officially reverted to Carcharias Taurus. This is the name approved by the International Code of Zoological Nomenclature or ICZN to date. The sand tiger shark is in no way related to the tiger shark Galeocerdo Cuvier; on the contrary, it’s closely related to the great white shark Carcharodon Carcharias. This species inhabits subtropical and temperate waters globally. Wherever it lives, it prefers the continental shelf especially sandy shorelines. Actually, it gets its name sand tiger shark from this preference for sandy terrain. They also swim in submerged reefs up to a depth of about 191 meters (627 feet). You’ll find them in the waters off the Japanese coast, around Australia, South Africa, the Mediterranean, and the eastern areas around North and South America.